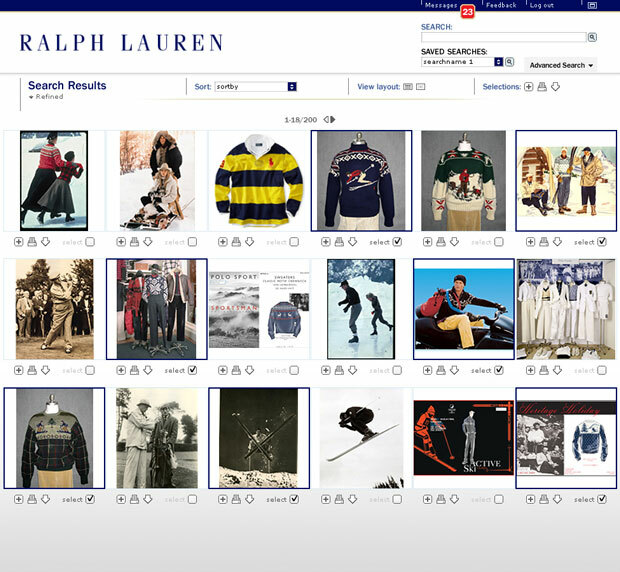 Ralph Lauren maintains a massive library of all the products created in the company’s 50 year history. Infosys Technologies hired TheBigSpace to create the application, system and user experience for a digitized archive. The archive was systematically constructed through photography and cataloged with a sophisticated taxonomy of styles, references and colors. Besides products, historical photographs, style images, past “lookbooks” and audio/video references, the archive contains over 20,000 unique colors and shades. Digital replaced the exclusive need for the physical resulting in the ability for remote teams to collaborate together. Designers could also check out physical items from the archive library by simply selecting products online and proceeding with a request. The archived product would be sent to internally. Alternatively, an interactive archive table was created to allow designers to simply drop garments on the table with their ID card to check-in/check-out items. This feature included a reminder to return and designer accountability, all alleviating the loss of products.